Rickie Fowler, dealing with an oblique strain, was three shots off the lead with eight holes left in the second round. 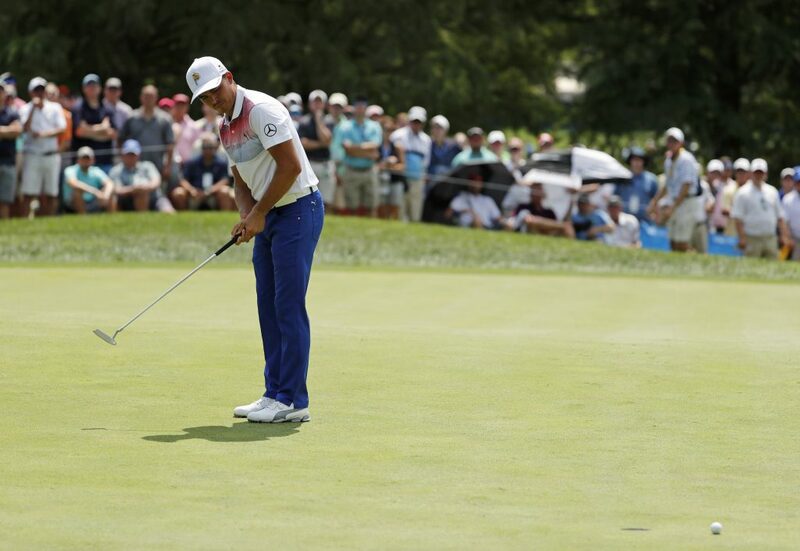 ST. LOUIS — Rickie Fowler isn’t looking for sympathy points. Turns out, he really doesn’t need them. Fowler has been playing taped up this week because of an oblique strain he suffered last week at Firestone. He says having his motion slightly restricted by the tape is actually helping, forcing him to make his swing more compact and gather all his speed at the bottom. Fowler stood at 7-under par for the tournament, three behind leader Gary Woodland, when a thunderstorm hit Friday in the middle of Fowler’s round. He had been keeping quiet about the injury but Dottie Pepper mentioned it on the TNT broadcast, and it was out there for the world to know. During the delay, he was asked about it on TV. Fowler was on the 11th hole when play was suspended for the day because of rain. THE ROARS began at the second hole, where Tiger Woods rolled in a putt for birdie, and they grew in volume when he stalked another putt toward the hole for a birdie at the third. But just as Woods was picking up momentum, another rumble brought him to a halt. It came with an ominously dark cloud that settled over the PGA Championship, bringing thunder and heavy rain that delayed the second round and left Woods pondering his third shot into the par-5 eighth hole. When play resumes at 7 a.m. Saturday, he’ll be 3 under for the championship and seven shots back of Gary Woodland, who played his second round early and was done long before the storms. Woods arrived for his tee time Friday knowing full well Woodland and others had gone low earlier in the day. The tees had been moved up, the hole locations had been made accessible, and the classic Robert Trent Jones design was ripe for the taking by the world’s best players. For as long as he was on the course, Woods proved he’s still one of them. He missed a birdie putt at the first hole but made one at the second, then stuck his approach shot close at the par-3 third, where water guards the right front. Woods knew he’d made that putt when it was still on the way, beginning his confident walk to pluck it from the hole early. Woods showed even more emotion at the long, difficult par-4 fourth. He had driven it into the right rough, then hit a low, screaming fade that dodged the greenside bunkers and ended up on the fringe. He popped a bump-and-run chip toward the hole and thought he had made it, beginning his famous fist-pump before the ball just skirted the cup. “I almost got a fist-pump on video!” one fan screamed. Woods kept the fist-pump in the holster when he poured in his third birdie of the round at the fifth, this time rolling in a 10-footer. With more massive crowds watching his every move, Woods curled in a long putt to save par out of the bunker at the sixth, and he nearly holed another chip before making par at the seventh. His drive at the eighth landed in the thick rough, and he hacked his way out to set up a short approach to the par 5. It was then that the skies darkened and the horns sounded, and it’s there that Woods will place his ball when he arrives at Bellerive to resume his second round Saturday. THERE ARE two players going by the same name this week: Zach Johnson of Cedar Rapids, Iowa, the two-time major winner, and Zach Johnson from Davis Park Golf Course in Utah, who was one of the 20 club pros to qualify into the year’s final major. In the second round, the club pro shot 69 and the two-time major winner shot 70. The 69 wasn’t good enough to keep Utah’s Zach Johnson here for the weekend, but going under par was certainly not a bad way to wrap up his first major tournament. “The memories are countless,” he said. “Just that walk up 18, my caddie and I just kind of put our arms around each other and soaked it all in. We don’t get to do this every day.